Do you remember when you first met God? Was it in Sunday School? A children’s Bible? Biblical coloring pages? We get older. We grow up. We develop our own ideas about who God is. We theologically theorize the who’s, whens, wheres, and whys of all that God is and could be. After all, we’re adults now. What if we had it right the first time? What if God is the old man in the sky, watching over us like a loving Father? Abigail is a new arrival in heaven. She didn’t come up through the Welcome Station, she came up “another way.” She’s getting used to the wings and the halo but she seems…disappointed. 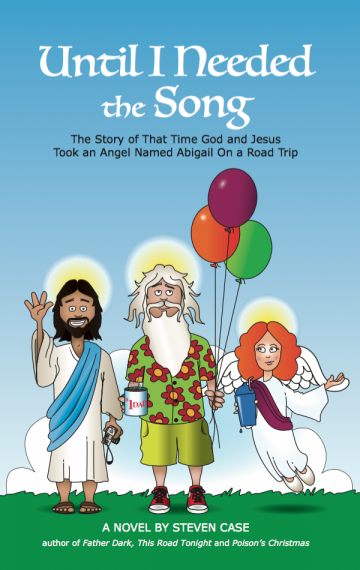 So God decides to take her on a road trip and Jesus comes along for the ride. Pack up all the questions you’ve had over the years. Pack your sense of humor and your kleenex and your favorite road tunes. You get to come along, too.